I am very intrigued by balance and tension and juxtaposition. There are "layers" that make up each person's life history and mind, and I therefore create layers in my sculpture to symbolize this. I often see things in the world as having an "inner and an outer", sometimes revealed to the world at large and sometimes hidden. My sculptures involve the relationship of the natural and man-made environments and the balance or imbalance between them. The work is inspired by a variety of sources. I have been influenced by diverse things, from spiritual styles as mandalas, "Contructivism," "drawing in space" and of course, nature. Artists like Calder, David Smith, Mark Di Suvero, Miro, Picasso, to name a few, have influenced me. 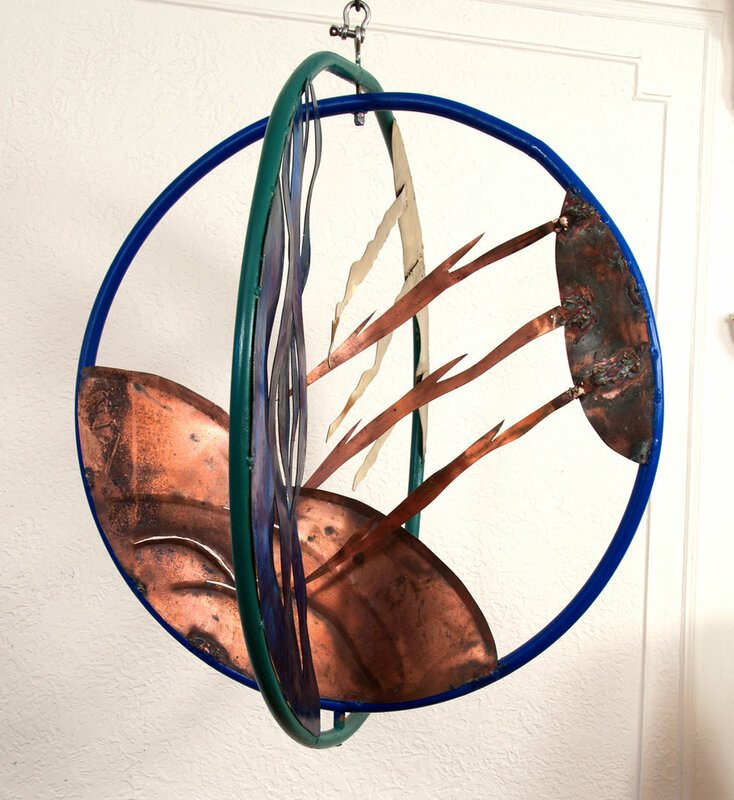 Current work often incorporates curved brass tubing with mobiles, color, sound and sometimes water. My stained glass work includes steel "frames" that are often octagonal and enclose a series of elements floating within this environment. I have also been exploring the use of depth (perspective), color and balance in my work. My collages incorporate past drawings, paintings and photographs into current layers of paint, handmade paper, bits of string and embroidery. The juxtaposition of old work and new work adds an autobiographical element to my mark making. My work displays a love of color, texture, shape, line and form. As I work, I am moved by how one color sits next to another and how one material plays off another. My work is layered to create complex richness yet honors simplicity. I love the language of art and have studied formally for many years, yet the surprises and visual nuances still excite me.